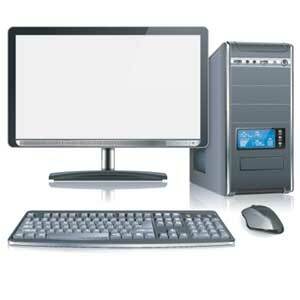 Following is the list of hardware’s required to setup a computer network. A computer can be connected to another one via a serial port but if we need to connect many computers to produce a network, this serial connection will not work. The solution is to use a central body to which other computers, printers, scanners etc. can be connected and then this body will manage or distribute network traffic. A router is a type of device which acts as the central point among computers and other devices that are part of a network. 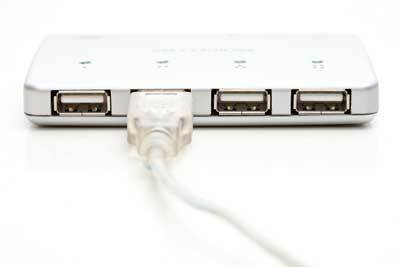 A router is equipped with holes called ports and computers and other devices are connected to a router using network cables. 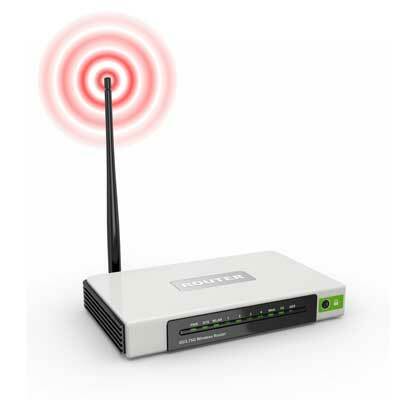 Now-a-days router comes in wireless modes using which computers can be connected without any physical cable. Network card is a necessary component of a computer without which a computer cannot be connected over a network. 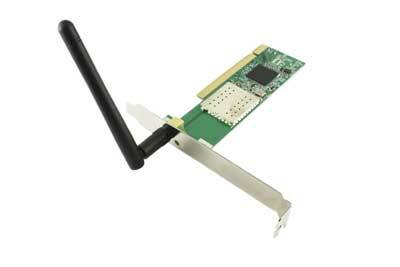 It is also known as network adapter or Network Interface Card (NIC). Most branded computers have network card pre-installed. 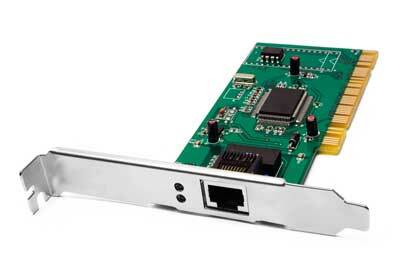 Network cards are of two types : Internal and External Network Cards. Motherboard has a slot for internal network card where it is to be inserted. Internal network cards are of two types in which first type uses Peripheral Component Interconnect (PCI) connection while the second type uses Industry Standard Architecture (ISA). 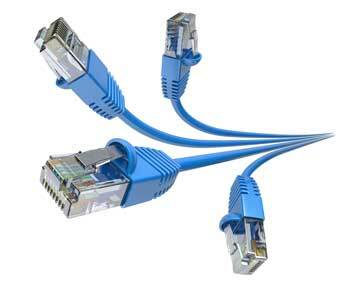 Network cables are required to provide network access. 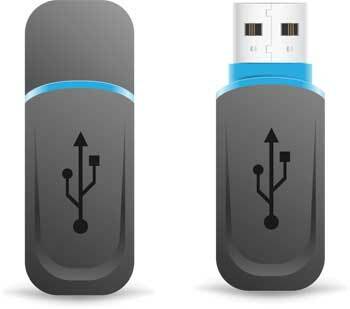 USB card are easy to use and connect via USB port. Computers automatically detect USB card and can install the drivers required to support the USB network card automatically. An operating system is a program that acts as an interface between the software and the computer hardware. It is an integrated set of specialised programs that are used to manage overall resources and operations of the computer. It is specialised software that controls and monitors the execution of all other programs that reside in the computer, including application programs and other system software. Memory Management — keeps tracks of primary memory i.e. what part of it is in use by whom, what part is not in use etc. and allocates the memory when a process or program requests it. Processor Management — allocates the processor(CPU) to a process and deallocates processor when it is no longer required. Device Management — keeps track of all devices. This is also called I/O controller that decides which process gets the device, when, and for how much time. 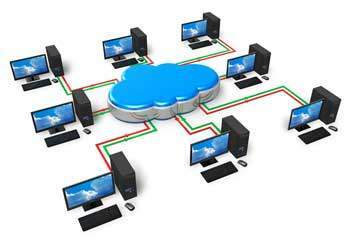 File Management — allocates and de-allocates the resources and decides who gets the resources. Security — prevents unauthorized access to programs and data by means of passwords and similar other techniques. Job accounting — keeps track of time and resources used by various jobs and/or users. Control over system performance — records delays between request for a service and from the system. Interaction with the operators — The interaction may take place via the console of the computer in the form of instructions. Operating System acknowledges the same, does the corresponding action and informs the operation by a display screen. Error-detecting aids — Production of dumps, traces, error messages and other debugging and error-detecting methods. Coordination between other software and users — Coordination and assignment of compilers, interpreters, assemblers and other software to the various users of the computer systems. 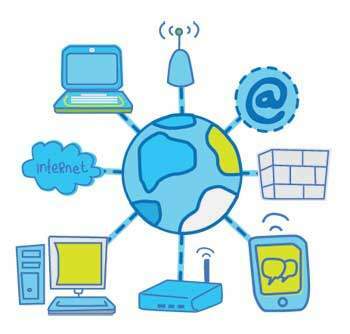 Internet is a world-wide / global system of interconnected computer networks. Every computer in internet is identified by a unique IP address. A special computer DNS (Domain Name Server) is used to give name to the IP Address so that user can locate a computer by a name. For example, a DNS server will resolve a name http://www.tutorialspoint.com to a particular IP address to uniquely identify the computer on which this website is hosted. Internet is accessible to every user all over the world. 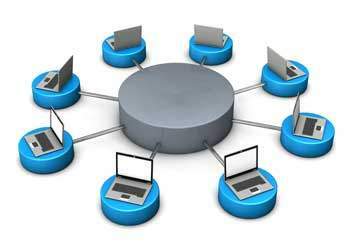 Intranet is system in which multiple PCs are connected to each other. Usually each company or organization has their own Intranet network and members/employees of that company can access the computers in their intranet. Each computer in Intranet is also identified by an IP Address which is unique among the computers in that Intranet. Internet is general to PCs all over the world whereas Intranet is specific to few PCs. Internet has wider access and provides a better access to websites to large population whereas Intranet is restricted. Internet is not as safe as Intranet as Intranet can be safely privatized as per the need. In this guide, we’ll help you to buy a desktop on component by component basis. As desktops are highly customizable, so it is better to learn about main parts and then go to manufacturer or retailer shop or site instead of looking at some specific model directly. Popular desktop brands are Dell, Lenovo, HP and Apple. Compare the desktops based on their specifications and base price. Size – It is the diagonal size of the LCD screen. Larger the area, bigger the picture screen. A bigger picture is preferable for movie watching and gaming. It will increase productivity as well. Resolution – This is the number of pixels on the screen. For example, 24-inch display is 1920×1200 (width by length) and 22-inch display which is 1680×1050. High resolution provides better picture quality and a nice gaming experience. Inputs – Now-a-days monitors can accept inputs from cable as well apart from computer. They also can have USB ports. Stand – Some monitors come with adjustable stands while some may not. 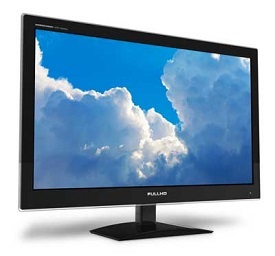 Recommended – 24 Inch LCD. Operating System is the main software of the computer as everything will run on it in one form or other. There are primarily three choices : Windows, Linux, Apple OS X.
Linux is free but people generally do not use it for home purpose. Apple OS X works only on Apple Desktops. Windows 7 is very popular among desktop users. Most of the computers come pre-equipped with Windows 7 Starter edition. Windows 8 is recently introduced and is available in market. Windows 7 and Windows 8 come in multiple versions from starter, home basic, home premium, professional, ultimate and enterprise editions. As edition version increases, their features list and price increases. Recommended – Windows 7 Home Premium. 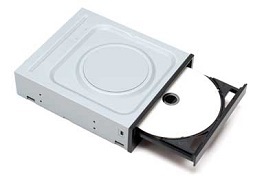 Optical drive is the drive on a computer which is responsible for using CD, DVD and Blu-ray discs. Now-a-days, DVD burners are industry standards. DVD Burner can burn CD, DVD and play them. DVD Burner is cheaper than Blu-ray drives. Blu-ray drives can play HD movies but are costlier component. 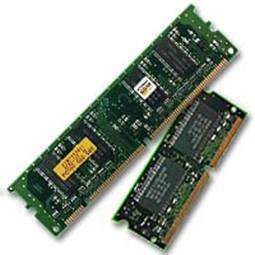 RAM is considered as Computer Memory as performance of a computer is directly proportional to its memory and processor. Today’s software and operating system require high memory. As per Windows 7, 1 GB is the minimum RAM required to function properly. Hard disk is used for storage purpose. Higher the capacity, more data you can save in it. Now-a-days computers are equipped with 500GB hard drive which can be extended to 2TB. 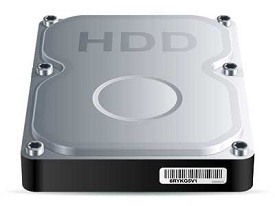 Most hard drives in desktop operate at the standard performance speed of 7200RPM. Frequency (GHz) – This determines speed of the processor. More the speed, better the CPU. 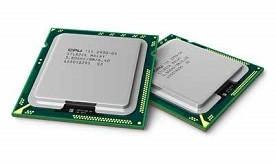 Cores – Now-a-days CPUs come with more than one core, which is like having more than one CPU in the computer. Programs which can take advantage of multi-core environment will run faster on such machines. Brand – Intel or AMD. Both are equivalent. Intel is in lead. Recommended – Intel Core i3 i3-3225 3.30 GHz Processor.